New York may have the dropping of the ball in Times Square with a huge Christmas tree in Rockefeller Square but Knowlton, Lac Brome, has a tree that rivals the best of the spirit as The Knowlton Marina has created one of the most amazing Christmas trees on the shores of Brome Lake that has ever been witnessed by man or Chrismas Angel! The traffic down Benoit Street heading towards the popular Marina has been increasing as word of the huge decorated tree spreads. 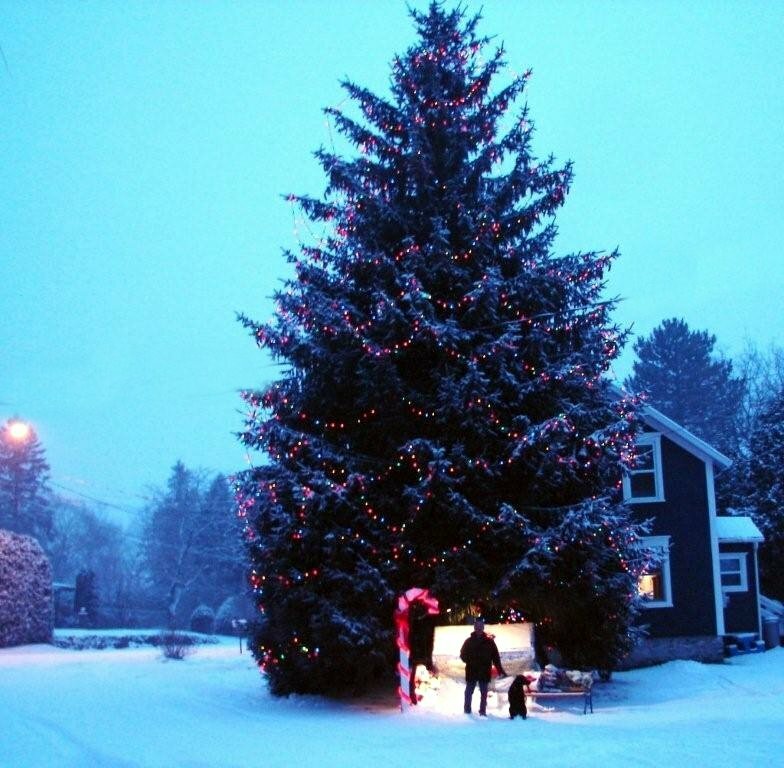 The lovely tree is at the Knowlton Marina which also features year-round cabin rentals and lake access. During the winter the skiers can embark on the cross-country trails from the Marina and of course the summer in Knowlton wouldn't be the same without a trip to the outdoor terrasse to watch the boats and ducks on Brome Lake. Anyone who lives within 500 miles of Brome Lake already knows that Gerry Moar is a pillar of the community who creates popular holiday themes at the marina including the popular Hallowe'en displays that are rated number one in the district. Beyond the thematic creations that Gerry and his family and staff create, he is a real booster in our community, offering many spare hours and offering freely of his time to become involved in the events in Knowlton like the Festival of Lights, the Winter Festival, the Fireworks Festival...the list is long! We wish to share a shining Holiday event with everyone. Knowlton's version of the Rockefeller Centre Christmas Tree! Our 55 foot fir tree is decorated with 2,200 sparkling LED lights, which consume the equivalent of only two 80 watt bulbs. Tucked under the boughs are a 7 foot illuminated candy cane, the biggest present ever, and a cozy bench for taking photos with family and friends. The tree is aglow each day at dusk until 10 PM, as of now throughout the Holidays. We invite everyone to take a stroll down to 82 Benoit street, Knowlton and share the Holiday cheer with those you love. (Don't forget the camera!) This fun event is given in Holiday spirit by the Greer and Moar families of Benoit street, Knowlton. Special thanks to Art Page and Robert St. Pierre for their creative work hanging the lights.